To start working with PolySmoother, select a node. If it is a supported node, the "Enable" button will be enabled and you can start previewing and working with the Smoothing Groups. 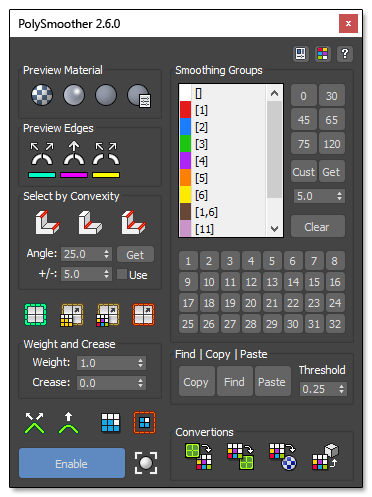 PolySmoother uses a mapping channel in order to preview the colorized smoothing groups. By default this channel is set to Color Channel, but you can change it from the PolySmoother Settings. If the mapping channel is in use, PolySmoother will ask to overwrite it. When you Enable PolySmoother, it will create a list with all the Smoothing Groups used by the node and assign a color to each different Smoothing Group. This list will be accessible in the "Smoothing Groups" section of the UI. PolySmoother does not support Specified Normals, so if your model has Specified Normals, you will be prompted to convert them to Smoothing Groups. Since version 2.5.0 top modifiers are supported. You still need to work with the base Editable Poly as EditPoly modifiers are not supported. Note that all functions will work on the base object and not on the top modifiers. If for example you have a modifier that changes the Smoothing Groups, PolySmoother will not reflect those changes. So, make sure none of the modifiers alters the smoothing groups.